consequences. User Experience research shows that involving users at every stage in the development of software leads to improved effectiveness, improved overall usability, and compliance with regulatory standards. By carrying out workshops and surveys, Cirdan has investigated which features have the highest priority for users within the development of Laboratory Information Systems (LIS). The results of this research are having a direct influence on the future of LIS within Cirdan. Experience (UX) techniques into their development processes to include users and establish the overall future of LIS. surrounding customer involvement in software development is a long-standing one. 2000s have not been redesigned since, leading to dated and difficult to use interfaces. With recent technological improvements, many companies are not looking to moving their LIS to the web. The adoption of new technology is often slow in the healthcare sector. Due to the complex nature of hospital systems, integrating new technologies can be a complex and time-consuming process. there are also patient-centric considerations to take into account around safety and security which can discourage implementing new systems (Thurston & Gagnon, 2017). 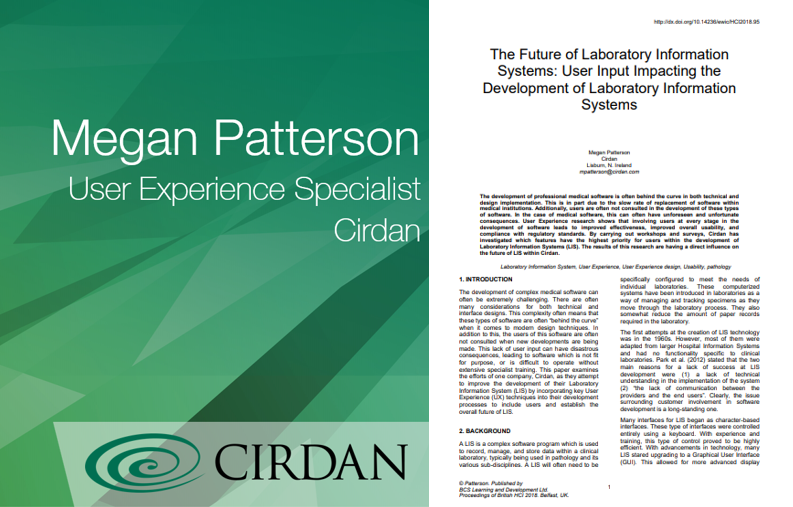 The above is an excerpt of a paper written by Megan Patterson, User Experience Specialist at Cirdan Ltd- The Future of Laboratory Information Systems: User Input Impacting the Development of Laboratory Information Systems. To read the article in full click here.